Jos van Immerseel, what does the motto ‘Anima Next Generation’ stand for, exactly? JVI: I have always regarded the direct transmission of musical knowledge from the perspective of practice to be the ‘root’ of musical interest. I believe in the power and potential of musical education. For this reason, Anima has for several years now been collaborating with partners such as Concertgebouw Brugge, the city conservatory of Brugge and the royal conservatory of Antwerp to offer various educational activities. These range from workshops for primary schools followed by an open rehearsal, to masterclasses for pre-professionals coached by Anima musicians. But the core of Anima Next Generation is the long-term collaboration we are building with young soloists – such as Chouchane Siranossian – and with assistant or guest conductors such as Korneel and Jakob. These are talented, genuinely interested young musicians who already possess great sensitivity to historical performance practice. I wish to help them deepen and strengthen this engagement by offering them as many opportunities as possible to gain experience. What makes Anima a fruitful breeding-ground for these young musicians? JVI: An orchestra like Anima is a unique working instrument. Every concert and every recording is preceded by careful and thorough research. Certainly for the later orchestral repertoire, such a far-reaching approach is unique. 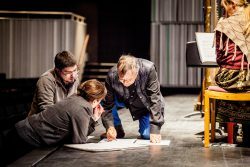 That is what makes the context and setting we can offer young musicians so special – and a project such as Anima Next Generation is to my mind necessary. By working from practice and laying the emphasis on historically inspired performances of more recent repertoire, your way of working complements traditional musical education. JVI: …which in my view overlooks many opportunities. I have the feeling that traditional musical education – with the exception of a few fortunate exceptions – has changed little in the past 30 or 40 years to keep pace with musical practice. And this is the case despite the enormous changes that the ‘early music movement’ has undergone in the meantime. Were things different and better when you were a student…? JVI: Not at all. There were certainly already musicians who were performing baroque music with a historical inspiration, but such an approach was not yet applied to the later repertoire. One exception was the organ class at the Antwerp conservatory: the musicians there had understood that it is simply impossible to play 10 centuries of music on one and the same instrument. They made me realize that a composer can only have conceived and written music for the instruments he was familiar with, and so it is logical to take those as one’s starting point. I call this the ‘obvious approach’ – a name that I prefer to that of the non-committal ‘historically inspired performance practice’. That musical education has not sufficiently kept its finger on the pulse of what musicians and researchers have accomplished in the past few decades is, moreover, reflected in today’s musical life as well. I am often struck by the fact that the icons of a half-century ago are the only ones thought to have had interesting ideas and authoritative interpretations, although since that time there has been an enormous amount of research, much repertoire has been discovered and exciting new voices have emerged. I find it a shame that those voices are not heard more frequently, and that their opportunities to engage in dialogue with old-timers like myself are scarce. That is why I hope that Anima Next Generation will remedy this situation to some extent. The ‘why’ of Anima Next Generation is thus clear, but: why now? JVI: I found that after 30 years, it was time to ensure that the experience and expertise we have built up will not be lost. With or without me: the orchestra must continue to evolve, and that is possible only if I leave behind more than an ’empty box’. The key to Anima’s future, I am convinced, is the knowledge capital we have accumulated. I consider this as the life’s work of many people, one that must continue to growth and yield fruit.